for close to seven years. You can see some of them here. 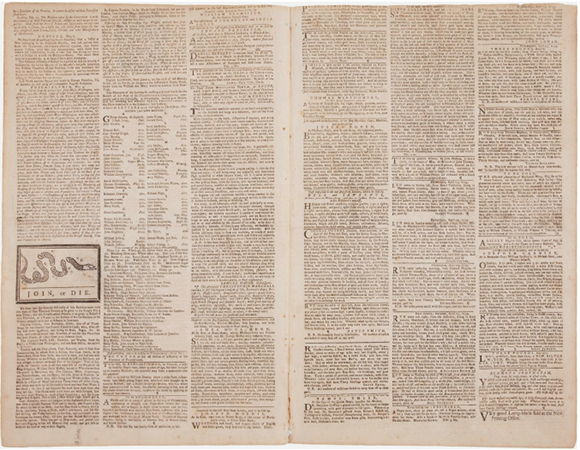 It was in the news recently because a rare copy of the May 9, 1754 issue will be sold at auction in California on September 13, 2011. You can submit a bid online, but I should warn you: the requested opening bid is $50,000. Oops– never mind. to unite against British rule. Not so. Franklin was actually urging the Colonies to unite against the French who were blocking British colonial expansion to the west. 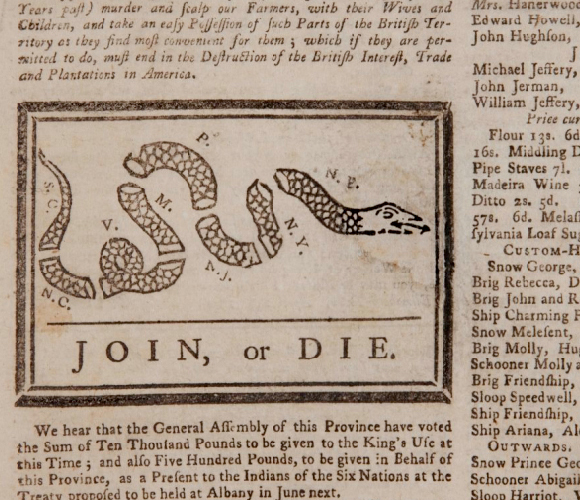 It was only later, when the cartoon was republished in 1765 by those who opposed the Stamp Act, that it became associated with rebellion against the British. Do you have any thoughts on Ben Franklin as a cartoonist, or about political cartoons in general? I’d be glad to have your comments. Political cartoons are really very sophisticated, aren’t they? The readers have to have enough background information to understand them. We lived in England for a few years, and it was some time before we understood enough of their past and present to ‘get’ the cartoons! You’re so right, and I can identify with your England experience: I love picking up cartoon collections at book sales. I found one by British cartoonist Carl Giles (1916-1995), who did social and political commentary for the Daily Express. His drawings absolutely convulsed me, but lacking the proper context, I didn’t “get” a single one! Always appreciate your stopping by, Margie– thanks!! To be honest I ignore all political cartoons but I love your cartoons. You’re very welcome, Zeg. I checked out your own work– it has great rollicking energy! I’m sure Mr. Franklin would be glad to know you’re carrying on the grand tradition. All the best, and thanks for stopping by! Much appreciated– thanks for stopping by! I just wanted to reply to the lovely comments that you made about my blog – Thank you so much for stopping by and I am pleased that you enjoyed it. Those cycle trails around your area sound fabulous. I love the illustrations on your blog – very cool!